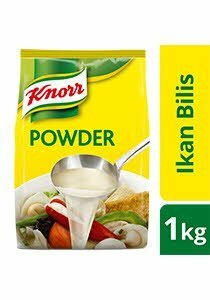 Made for Chefs by Chefs, Knorr Ikan Bilis Seasoning Powder is a versatile seasoning that boosts the flavour of ikan bilis stocks or seafood dishes. Salt, Maltodextrin, Permitted Flavour Enhancer (E621, E635), Anchovies, Sugar, Hydrolysed Vegetable Protein, Onion,Palm Fat, Spice and White Pepper. All food additives used are from plant origin. May contain traces of cereals containing gluten, crustacean, soy, egg, milk, mollusc, peanut and tree nuts. For Basic Stock: Dissolve 24g (2 heaped tablespoons) of Knorr Ikan Bilis Seasoning Powder in 1 litre of boiling water.